Happy days are here again… sexism is not in jeopardy! 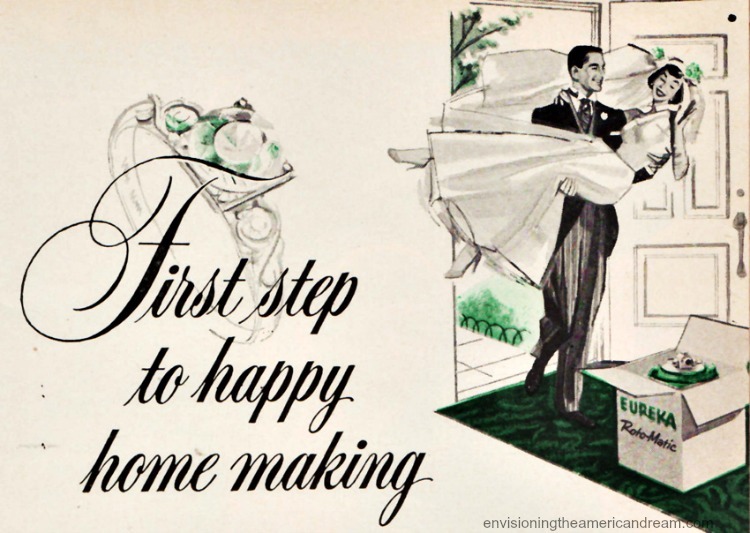 Once upon a time when patriarchy ruled, the American housewife was perceived as the most envied gal in the world and a new vacuum cleaner was enough to send her over the moon. When a category on a recent episode of Jeopardy asked “What Women Want” the answers were disturbingly retro. Instead of things women really want like, oh say equal pay or paid maternity leave, the correct responses were herbal tea, good fitting Levis and a vacuum cleaner! 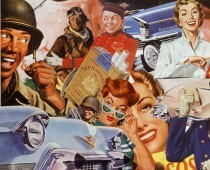 These notions are as antiquated as these vintage ads. Smart husbands have long known a vacuum cleaner that beats as it sweeps was sure to make their better half’s heart skip a beat with excitement. After all what red-blooded American man doesn’t want to get their wife in a Hoovering Mood. Isn’t this about what a husband really says at Christmas time when he gives a Hoover Cleaner to a wife? 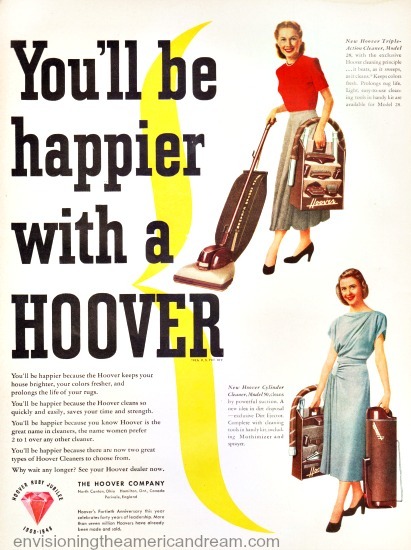 asks this Hoover ad from 1946. “I want you to work less. I want you have more leisure. I want you to save your strength. I want to make it easier for you to keep the home we’- re so proud of. I want you to have a cleaner to help you- and I want you to have a cleaner the world says is the finest. And she wants you to help! Nothing stars a new home and new romance like a vacuum cleaner. But hubby be careful what you want. 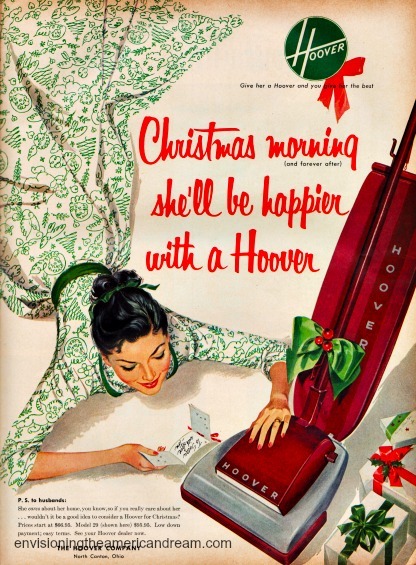 Your wife’s affections may soon be displaced by her love of her vacuum cleaner. Like a stubborn stain that won’t come out, sexism still lingers. I have a rule at home: Never buy my wife a gift that plugs in (corollary: it’s OK to buy her a new mobile device). I have a rule at work: Never make ads that discriminate, stereotype, patronize or belittle anybody. Yeah, when the little woman opened her Christmas gift, she was so pleased, she went right to the kitchen and made hubby his favorite supper! Later, hubby got another surprise after the lights went out, the dear romantic darling! 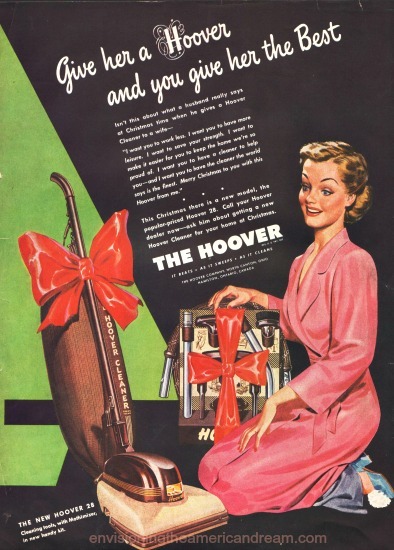 I’ve seen a “Hoover for Christmas” ad from 1924, emphasizing the “tools” in her “workshop” (her home), that “Brave little woman,” and ending “Don’t disappoint her again this Christmas.” Apparently this ad campaign worked for 30 years, if you don’t count all the women who said “thank you” and then burst into tears in the kitchen. Of course, in 1924 the alternative to vacuuming was dragging the heavy carpets out to the laundry line and beating the dust out of them — and onto yourself — so there was an element of thoughtfulness in giving a vacuum back in 1924. I just hope it wasn’t a substitute for a more personal gift! What could say, “The honeymoon is over,” louder than a vacuum for Christmas? Pingback: Ideal woman and ideal feminist | What is feminism anyway?